alaTest has collected and analyzed 35 reviews of Delonghi KG 39. The average rating for this product is 4.1/5, compared to an average rating of 4.4/5 for other products in the same category for all reviews. Reviewers are impressed by the performance and durability. The design and price are also appreciated, whereas there are some critical comments about the size and maintenance. We analyzed user and expert ratings, product age and more factors. Compared to other products in the same category the Delonghi KG 39 is awarded an overall alaScore™ of 79/100 = Good quality. You have to turn the whole unit upside down to empty. Difficult to clean. Meaningless indicators. 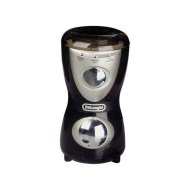 A reasonable, value for money coffee grinder. Not easy to get the coffee out or to clean. Does everything it's supposed to and very easy to use. Slightly tricky to wipe out. Its great, it works, very happy! It's a real pain in cleaning it everytime you use it, I did check that it needs cleaning everytime, IT DOES! Easy to use, tells you when the beans are ground to the required consistency. It's easy to use and has helpful lights to indicate the different gradings for the grounding. It's a bit tricky to get all of the ground coffee out and it's not that easy to clean. Green LEDs indicate grind consistency of the beans. Cup selector allows user to grind 4-12 cups.